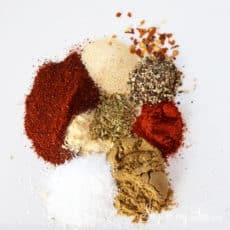 Home » Recipes » How do I make Homemade Taco Seasoning? How do I make Homemade Taco Seasoning? Homemade taco seasoning is a healthy alternative to the store-bought version. You can pronounce all the ingredients and know exactly what you are eating. So if you are wanting to get more healthy give this yummy seasoning a try! For a few more meal ideas with a Mexican flare try my walking tacos, Mexican Skillet Rice or Southwestern Salad! Did you know you can even make your own tortilla bowls? Fill them up with taco meat, salad and all the fixings for a delicious dinner. What is in taco seasoning? Most likely you will have all these spices in your cabinet and can whip up this homemade taco seasoning anytime! Unlike storebought taco seasoning packets, this one is naturally gluten-free. Just make sure all your spices are gluten-free. They should be naturally gluten free if they are pure and not a blend, but sometimes could be processed on equipment that processes gluten. Another bonus with making your own taco seasoning is that you can control the salt if you are watching your salt intake. Never buy storebought taco seasoning again. This delicious recipe takes out all the fillers and chemicals and gives you only homemade goodness. Mix together. Store in an air tight container. To make taco meat. Brown about 1 pound meat and drain off fat. Add all spices and about 1/3 - 1/2 cup water. Cook, stirring frequently until most of the liquid is absorbed. Now you are ready to make delicious tacos! What can you make with taco seasoning? 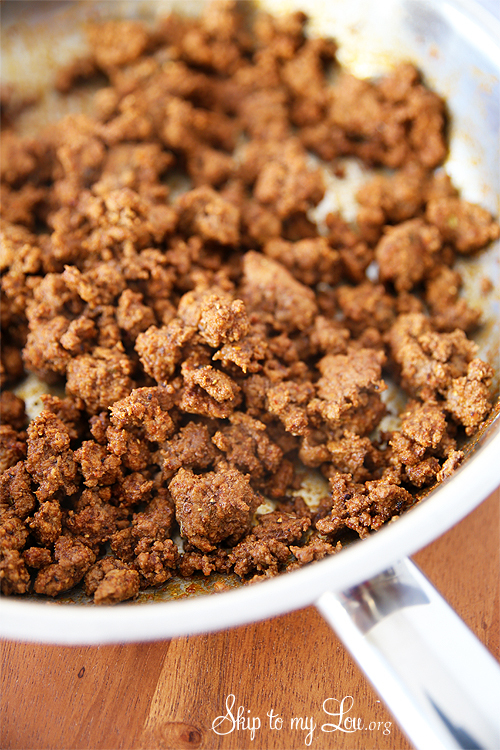 I use this homemade taco seasoning to make taco meat. But you can also use it for chicken and port too. It makes a great rub. It can be substituted in any recipe that calls for a package of taco seasoning mix. I use it to make this delicious taco soup. It is also the mix I use in this Instant Pot Taco Soup. Brown about 1 pound meat and drain off fat. Add all spices and about 1/3 – 1/2 cup water. Cook, stirring frequently until most of the liquid is absorbed. Now you are ready to make delicious tacos! I hope you love this taco seasoning recipe! Let me know what you think. Fantastic!! It was just right (although, I left out the red pepper flakes- too spicy for me). I accidently used it with 2 pounds, it would have been even better with 1 pound. Next time I will double it up!!! Great job figuring it out!! how much does this make? how many teaspoons ? i want to make this in a larger quantity , so i don,t have to hunt the recipe every time. Oh, Marshal, I don't know. Wonder if you could make it and measure, then continue with a larger batch and then you would know. Please let us know if you try this! recipe for taco seasoning doesn't say how much ground beef to use for this recipe. I used about one pound of ground beef. I tried this recipe on a taco night because we already had all the ingredients in the cupboard. It tasted very good, though a bit spicier than the average seasoning packet. I liked the spicy flavoring, so it didn't bother me one bit. I love that you know exactly what is in the seasoning! Making some very soon! I think this recipe is more of a season to your taste not nessisarilly per pound. I will have to try this recipe soon thank you. I used it for 1 pound of ground beef. Hi. How much meat is this for? 1lb....or more? Thanks! Looks tasty. Wonder if you have ever scaled it up and made a much larger quantity. Yes finally a taco mix I can always keep on hand for meals!